Little girls everywhere rejoice! Our new Mini Castle Bed for Girls is a cheaper alternative to the traditional castle bed by Maxtrix Kids. We simply left off the top tent and kept all of the key components of the girls' castle bed. We hope this cheaper version will help more families afford this amazing bed. Don't worry - it's not a cheap castle bed. It's the same quality, solid wood bed that has made Maxtrix Kids our best selling furniture line. It's simply a mini version that's less expensive. Who knew a cheap castle bed could be so much fun for little girls! We hope you love this new option. Customize this Maxtrix Bed. Full Description Little girls everywhere rejoice! 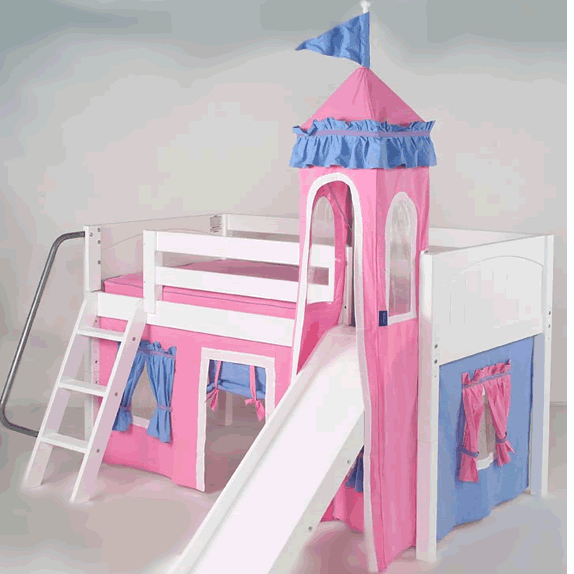 Our new Mini Castle Bed for Girls is a cheaper alternative to the traditional castle bed by Maxtrix Kids. We simply left off the top tent and kept all of the key components of the girls' castle bed. We hope this cheaper version will help more families afford this amazing bed. Don't worry - it's not a cheap castle bed. It's the same quality, solid wood bed that has made Maxtrix Kids our best selling furniture line. It's simply a mini version that's less expensive. Who knew a cheap castle bed could be so much fun for little girls! We hope you love this new option. Customize this Maxtrix Bed. Safety, Quality, Value: Solid construction. All hard woods graded clean and clear select with no knots. White furniture painted with lead-free Sherwin Williams paint. Rock Lock mechanism makes bunks and lofts rock solid. Maximum capacity of 800 lbs. is double regulation weight. One of the highest safety rails in the industry. Low-profile Maxtrix mattress (available separately) offers even more protection from safety rail. Mattresses made with soy-based foam, organic quilted cotton, and extra flame-repellant barrier that exceeds standards. Finials not recommended on raised beds for young kids as they pose a strangulation hazard. Modular design makes it easy to change bed to different loft heights or bunk bed options as your kids grow. Similar Configurations: You can use this product page to order any of the following Maxtrix Loft Bed configurations: Marvelous, Wow, Brainy, Smart, Amazing, Fantastic, Swot, Slap, Awesome, Sweet, Ranger, Ninja, Sugar, Honey, Pretty and Witty. You don't need to know these names to order from us, but we include this information in case you're ordering from a Maxtrix catalog. 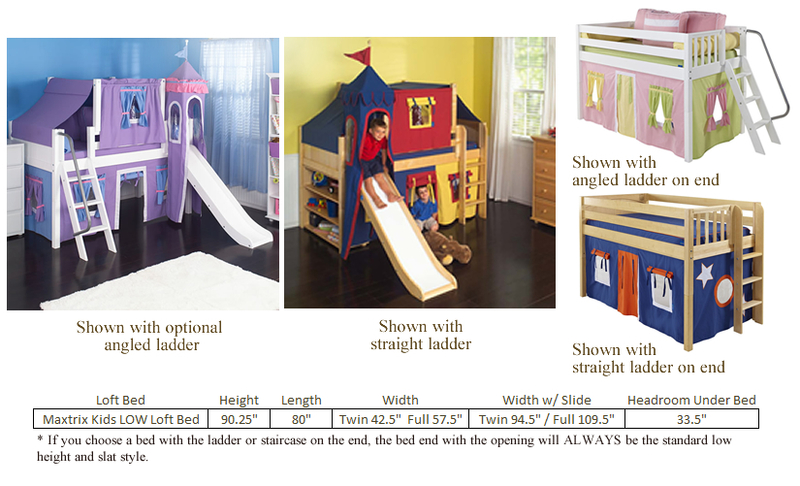 Maxtrix Kids Mini Castle Bed Includes: low loft bed, safety rails, straight ladder (can upgrade to angled ladder), slide, under bed curtains, and castle tower with flag. Please Note: If ordering bottom curtains, please note that the standard curtain set covers the front of bed and one bed end. This will cover all openings if the bed is in the corner of the room. If the bed will be in the middle of a wall, you can order an additional end panel to cover the other end of the bed. Choose any wood color and bed end style.